Eucalyptus essential oil has a sharp and penetrating aroma with a camphoraceous scent and a woody, balsamic undertone. 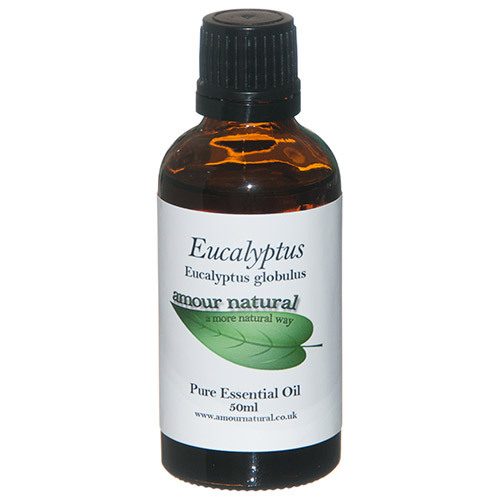 Eucalyptus essential oil is a cooling oil, that is renowned for being stimulating, refreshing, clearing, purifying and regulating. The oil is distilled from the leaves of the Eucalyptus tree using steam to maintain the integrity of the active ingredients. This essential oil blends well with lavender, thyme, rosemary, marjoram, pine, cedarwood and lemon. Suggestions for use: Add 6-10 drops in a bath. Mix 5 drops with water to use in an oil burner. Mix 6-10 drops with hot water as an inhalation. Mix 5 drops per 10ml of carrier oil for massage. If you are pregnant or have a medical condition, consult your practitioner before use. Below are reviews of Amour Natural Eucalyptus Pure Essential Oil - 50ml by bodykind customers. If you have tried this product we'd love to hear what you think so please leave a review. Love this oil and works so well, didn't know but do now that it helps with all allergies!